SMath Studio? We never heard of it, yet it looks very promising at first glance. I bookmark this site as I am at work yet I will definetly download this tool and give it a brief try. 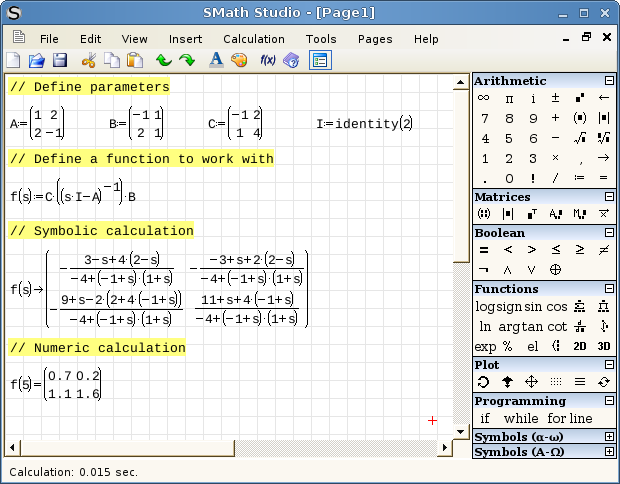 Altogether, even if this software is not better than Mathcad, we will post a good review about it on our blogsite. Wery good job. The user interface works just like mathcad.I thik the functions are good enough for everyday use for a standart user, engineer. For the complete replacement of matchad I would like to have units in the program. I think its wery important to have at least the basic SI units. m,g,t,N,Pa etc. I’ve tried it, but not to my satisfaction. It still lacks a lot of features, most importantly, it’s not unit aware. There’s still no good alternative to Mathcad. Rather than simply saying ‘it lacks features’ it is better to say exactly what it does lack. That way the developer has a chance of fixing it. @Joshua I tried comppad but from all appearances it’s just a math expression layout tool, it is not a live mathematical spreadsheet like MathCAD. thanks for the tip, I’ve downloaded SMath and it’s just fine! I was looking for some software able to handle very complex formulas for modeling my system (and with a easier interface then Matlab) and this fits exactly with what I was looking for! Delighted to finally see some competition for PTC MathCad. Before PTC bought Mathsoft, MathCad could be had for a reasonable price but that is history now. I would like to see some beefed up graphics for plotting: Control for axes ranges and a log scale option. sMath handles units really well now, including seamlessly converting between SI and other units. You can use mixed units in the same expression if you want to. (Not sure why you would, but just to demonstrate how flexible it is.) It has most Imperial units, plus you can define your own units if the units you need aren’t pre-programed. Anyone know how to stop the Smath pdf plugin from putting the date and time stamp with the file location in the pdf header?